There’s a lot to love about Pinehurst, North Carolina. Whenever my spring golf trip buddies and I go there, a relaxing feeling comes over me as we drive along Midland Road. The Village, the Pinehurst Resort, and the other golf courses in the area never fail to create an impression of genteel golfing elegance. 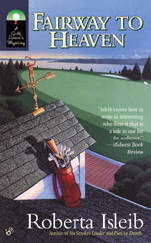 When Roberta Isleib decided to place the action in her newest Cassie Burdette mystery novel in and around the famous golfing destination, I wondered how she would deal with the contrast between the normally bucolic surroundings and the tumultuous events that often swirl around the young LPGA heroine. As one might expect, Isleib handled it very well, in Fairway to Heaven, (Berkley: $6.50 SRP). The fourth book in the series combines several stressful events in Burdette’s life. She’s a reluctant maid of honor for a girlfriend whose fiancé is on the men’s Tour. Burdette is still trying to figure out if her own relationship with PGA pro Mike Callahan is going anywhere, or whether there are promising signs from someone else. As if a major society wedding wasn’t enough fun for a long weekend, Burdette is also scheduled to play in a three-Tour Silly Season event at Pinehurst No. 2. Anyone who’s played a Donald Ross course will tell you that the greens are deceptively shaped. A shot that’s off by a mere fraction won’t stay put. When your playing partners are your father, whose abandonment of Cassie and the rest of his first family left some deep scars, and your boyfriend, whose commitment seems to veer as much as his drives off the tee, the pressure can only build up from there. Burdette discovers that she must also be careful to avoid at least two other kinds of shots, either type of which could prove deadly. These are murder mysteries, after all, so the occasional body or two shows up at inconvenient moments. One of life’s pitfalls is our tendency to repeat mistakes instead of learning from them. Cassie has shown more than her share of this talent for continuing self-inflicted trouble in past escapades, but there are some promising signs of improvement during this episode. Isleib created a character that readers can really like and care about, and I found myself pulling for Cassie to continue on the path to maturity. Cassie discovers that some of her friends and acquaintances are on a similar journey. For example, the bride-to-be has a significant over-investment in the trappings of a full-scale traditional wedding, complete with opportunities for significant embarrassment for some of its participants. The story of the bridal shower alone should be enough for the male readers to be very glad they don’t attend them, and should cause some rueful laughs of recognition among women readers. Another bridesmaid also seems to be just a little too interested in Mike Callahan for Cassie’s comfort. Signs point to a possible confrontation. In the meantime, however, the bride’s family must deal with a major crisis that comes up just as the wedding events are underway. It forms the major plot line for the story, and brings Cassie into contact not only with the local authorities, but also with some ill-tempered folks who decide her stay in Pinehurst should be cut well short. 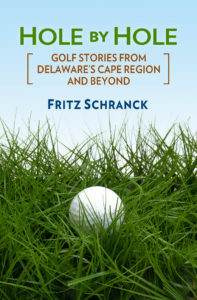 Readers who live or have visited the Pinehurst area should have a lot of fun reading Fairway to Heaven. The action shifts around several different spots in the little village which actually exist. The finish is a bit abrupt, but logically satisfactory nonetheless. There are also some additional indicators that Cassie’s growing maturity will help her handle the next adventure in this fun mystery series. Pete Oakley, budding Champions Tour player and the Director of Golf at The Rookery, continues to learn how difficult playing on the nation’s top senior circuit can be. Playing in the Liberty Mutual Legends of Golf event April 22-24 in Savannah, Georgia, Oakley struggled in the heavy weather in the last round. This week Oakley is in Austin, Texas for the Fed-Ex Kinko’s Classic, held at The Hills Country Club. Marsh Island Golf Course in Angola is the scene for an upcoming co-ed scramble golf tournament on May 21, 2005. The money raised from the event supports the mission of The Susan G. Komen Breast Cancer Foundation. For more information, please contact Holly Walsh at 302-684-1783.